The Akron & Barberton Belt (A&BB) was a freight hauling railroad that formed an industrial belt in and around Akron, Ohio. 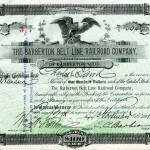 The A&BB was created on May 6, 1902 (Operations beginning on May 15, 1902) from the consolidation of The Barberton Belt Line Railroad Company; The Cleveland, Barberton and Western Railroad Company; and The Barberton, Akron and Eastern Belt Line Railroad Company. 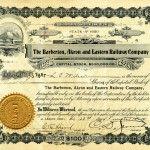 Then, on April 26, 1905 the company acquired The Barberton and Southern Railroad Company. The railroad was sold by Owner, O.C. Barber to a group of four railroads including The Pennsylvania Company (Cleveland, Akron and Cincinnati Railway Company), The Baltimore and Ohio Rail Road Company, the Erie Railroad Company, and The Northern Ohio Railroad Company. On July 21, 1994 the Akron Barberton Cluster Railway took over the assets of the A&BB. The new Akron Barberton Cluster is owned by the Wheeling Corporation, owners of the Wheeling and Lake Erie Railroad.